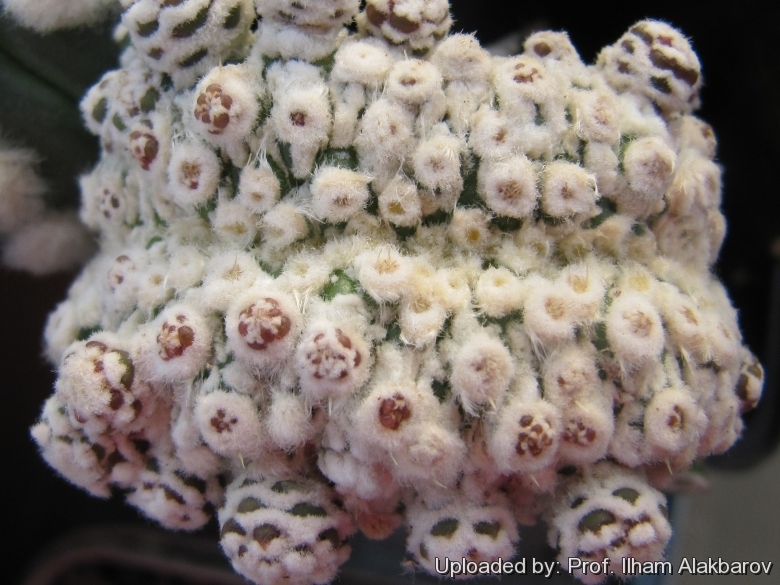 Description: The 'Superkabuto prolifera' varies from the typical Astrophytum asterias for the epidermis, that does not have simple dots, but a mosaic of more or less extensive white woolly spots that make the plant look intensely maculate and for the abnormal tendency to branch forming small side pups from the areole. In cultivation there are innumerable clones showing varies degreed of monstrosity some of them branching like mad, while other almost normal. Crested form: The crested form (Astrophytum asterias cv. Superkabuto f. prolifera cristata) - despite to its beauty - is very rare and sought after by collectors, for its unique features. There are several crested clones mainly selected by Asian growers. Stem: Dimension 3-7 cm tall, 5-10 cm in diameter. Flowers: Like those of Astrophytum asterias, yellow with a red throat. Remarks: This is one of the less known and strange Japanese cultivars. It is seldom seen in cactus collections. Cultivation and Propagation: Although regarded as a choice and difficult plant, Astrophytum asterias cv. Superkabuto f. prolifera cristata is not too difficult in a greenhouse, but grows quite slowly. It is almost always seen as a grafted plant but can grow on its own roots too. Use mineral well permeable mineral soil with little organic matter (peat, humus). Water sparingly from March till October (weekly during summertime, if the weather is sunny enough), with a little fertilizer added. keep perfectly dry in winter at temperatures from 5 to 15 degrees centigrade. (but it is relatively cold resistant and hardy to -7° (-10°)C for short periods) In the rest period no high atmospheric humidity!! They need a good amount of light shade to full sun this help to keep the plants healthy, although slow growth.